Describe your dream vacation to Croatia. We match you with up to 3 top Croatia travel specialists, and they compete to plan your trip. Visiting Croatia is a summer love story with the country cast as the tale's seductive protagonist. Sapphire waters and lavish islands entice you in, while flirtatious smiles emanate from quaint walled towns. Gracious old-world glamour elevates Croatia from Mediterranean fancy to the real deal. It only takes one visit for amorous ties to be forever forged. Croatia's tones are warm and rich; the colors of summer cascade all year round. The eye wanders across monochromic orange roof tiles to untrammeled beaches, on wards to benevolent waters and along to forests of pine. Each initial panorama is a postcard, a frame of Mediterranean bliss tucked into a blossoming corner of Eastern Europe. But ravishing as she may be, Croatia's allure is not merely one of aesthetics. Sentiments of old-world charm are inescapable, whether you're sipping fruit wine at waterfront restaurants, lounging in World Heritage towns, or feeling soft sand beneath bare feet. A quaint mystery radiates throughout, tumbling down from hilltop ruins to cobblestone Venetian streets. While Croatia has blossomed as a modern nation within the European Union, it retains an atmosphere of exoticism. A thousand tales of Croatian history are etched into the old walled towns that dot the coast. These start in ancient Rome and continue through four centuries of Venetian rule. More recently, Croatia has the flavors of Ottoman elegance and the remnants of its part in former Yugoslavia. Consistent throughout these chronicles is Croatia's role as an up-market tourist destination. Ever since Roman emperors and star-crossed Venetian lovers escaped here, the country has always rewarded indulgent tastes and aspirations for exclusivity; untrammeled Dalmatian islands offer a getaway beneath balmy skies, forest walkways open onto veiled waterfalls, private yachts lull in deserted bays, and boutique guesthouse terraces gaze down on 14th century stone staircases. An atmosphere of splendor wraps everything in a blanket of romance, the panoramas soft on the eyes and the destinations reveling in impressions of escapism. The historic grandeur of Dubrovnik: The grandest of the country's ancient walled cities, World Heritage Dubrovnik, towers over sapphire waters with its streets of eternal seduction. Fortressed walls look down on sloped tiles, boutiques emerge down softly illuminated alleys, and city squares are wrapped in the chatter from al fresco terraces. Fully pedestrianized and carefully preserved, Dubrovnik is a 15th century Adriatic wonder that few people want to leave. Sailing the Adriatic in a private yacht: Cruising Mediterranean waters in a private yacht is one of Europe's most iconic experiences. Historic wooden vessels offer the elegance of sailing, your yacht propelled by wind power as an evocative coastline gently rolls past. Modern motorized yachts cruise at a faster speed, allowing you to tour all the eclectic treasures of Croatia's Adriatic coastline. In recent years, Croatia has emerged as Europe's premier destination for private sailing trips, the coastline offering dozens of potential routes; dock in secluded bays, explore tiny coastal villages, and snorkel below the sheets of turquoise. Getting inspired by the Game of Thrones: The Game of Thrones filming locations radiate a hazy mix of fictional narratives and inspiring history. Crumbling fortresses cling to hilltops, heirlooms of Roman splendor are sprinkled through the country, and climatic moments are relived on islands of superlatives. As the sublime mingles with the surreal, it's difficult to imagine that the alluring Game of Thrones series could have been filmed anywhere else (but this Game of Thrones tour of Croatia will be sure to delight the most passionate fans of the series). Delightful Hvar: Scattered along the coastline are dozens of islands, many of them unruffled and virtually untouched by modern development. World Heritage Hvar is perhaps the finest, a succession of serene beaches rolling around a Greco Roman town with 24 centuries of history. Fine art galleries and grilled lobster fumes spill from the seaside fortress, while the old town church bells give the island its delectably slow rhythm. 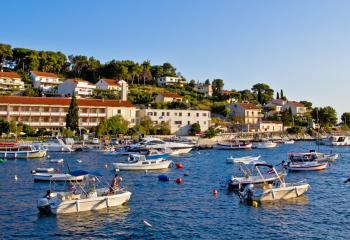 A current favorite of many celebrities, Hvar epitomizes the unique atmosphere of Croatia. The splendor of Plitvice Lakes: Cascading through lush forests, the Plitvice Lakes are a symbol of Croatia's inland beauty. A series of wooden walkways and platforms take you through the park, running alongside limestone formations, transparent rivers, and mystically cloaked waterfalls. Hemmed in by green, Plitvice is an explosion of grace and color. It's just one of many Croatian national parks. Old meets new in Split: In many ways, Split epitomizes Croatia's idiosyncratic appeal and cauldron of balanced tastes. A vibrant modernity effortlessly blends with history, highlighted by fine dining seafood restaurants that overlook the ancient mausoleum or medieval cathedral. Most postcards are a juxtaposition of 1600 years of history; Gothic, Renaissance, baroque, a harbor filled with super yachts, and Roman walls that encase the Diocletian's Palace. And like all things Croatian, the contrasts are harmonious. 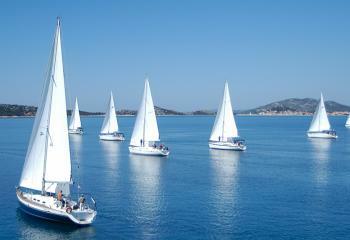 Split is also a great starting point for an Adriatic yacht cruise. Beautiful rural roads and cruising the Adriatic waters: Croatia's compact size enables two distinct routes to be combined. Country roads pass wandering livestock as they meander through the mountains, dissecting valley after valley and showcasing an atmosphere of rural Eastern Europe. Calm Adriatic waters provide a very different experience. Going by yacht or scheduled ferry offers gracious views of the coastline, whether you're traveling to the islands or simply hopping down the coast. Quick yet calm, it's a form of transport that elevates the immersion into a country excelling in the serene. Chic Italian flavors in Istria and Pula: For most of its history, the province of Istria has been a part of Italy. The town effortlessly blends the best of two countries. There's the urban chic and boutique elegance of Italy found in the pastel-colored Venetian era houses and valleys of vineyards. Croatia's exoticism reigns in the seaside fishing villages and pine-enveloped deserted islands of Brijuni National Park. Quaint coastal Pula ties it all together, its magnificent Roman amphitheater one of the finest in the world. Exhilarating mountains and combining the journey with Slovenia: Inland Croatia is wild and rugged, the mountain roads curving past tiny traditional villages and forest clad slopes. Biokovo Mountain offers an easy day away from the beaches of Dalmatia, while mountain bike and hiking adventures meander through the Dinaric Alps to the north. Neighboring Slovenia continues the impressions of alpine brilliance, its compact series of lakes and peaks making for another inimitable glimpse at Eastern Europe. Escaping to deserted islands: Croatia's islands promise seclusion and exclusivity, hundreds of them basking in the turquoise waters of the Adriatic. Some of the smallest have been converted into private island escapes, idyllic romantic getaways reserved for just you and a partner. Car-free and liberally coated in tradition, the Elaphiti Islands make for more serene days in the sun, hardly another set of footprints found in the sand. Or try the Jornati Islands, a marine national park of rocky islets and sublime snorkeling. The majority of these secluded islands are within easy reach of the coastal ports of Zadar, Dubrovnik, and Split. An archipelago of pleasure around Zadar and North Dalmatia: Zadar's unique sea organ plays the melody of North Dalmatia, the euphonic music created by waves crashing through underwater pipes. Firmly rooted in tradition, Zadar is a quaint coastal base for adventures into an archipelago of rocky islets and romantic bays. And just like the random tones from the marble encased organ, every moment in North Dalmatia is novel and melodic. An intriguing mix of styles in capital Zagreb: Undeservedly overlooked by many visitors, capital city Zagreb is one of Europe's most compact and charming. The city is the fashion capital of Eastern Europe, full of fine dining, vintage shopping, and exclusive hangouts. Dashing and stylish, its historic suburbs have been refurbished to take you through the ages. Starting in medieval times you journey into Austro-Hungarian history, and then18th century Baroque styles, before the evenings bring debonair locals onto tree-lined city squares. Many cities lay claim to the title 'Paris of the East.' Zagreb offers the idolized promise without having to boast. European history without the crowds in Central Dalmatia: Croatia's UNESCO World Heritage Sites are amongst the least crowded in Europe, just a handful of other visitors exploring the worlds of ancient Roman and Venetian glory. Peacefully wallowing in boutique beauty, the Trogir and Sibenik Cathedrals are timeless showcases of Europe's history. Close to Zagreb, vintage wine bottles pile up on cafe terraces in the citadel of Osijek. Then there are the striking mosaics in Porec's Euphrasian Basilica. With sublime monuments to be found all over Croatia, it's easy to incorporate slices of heritage into a beach crafted vacation. Unspoiled South Dalmatia and the Peljesac peninsula: While Dubrovnik undoubtedly wows the crowds in South Dalmatia, the whole region is a treasure trove of exclusive experiences. Cruise through the hills of the Peljesac Peninsula, sampling fresh oysters in towns that cascade down precipitous cliffs. Peljesac's vineyards are the country's finest, while the forested islands of Korcula and Mljet provide a green backdrop to saltwater lakes and long yellow sand beaches. Contemporary evenings at one of Croatia's many summer festivals: Croatia really comes alive on the long balmy evenings of summer. A dozen open-air festivals showcase contemporary music and film, including the jazz-tinged Dubrovnik Summer Festival and the Motovun Film Festival, Eastern Europe's version of the Cannes Festival. Many islands have a thriving boutique festival scene, great for young couples seeking to add some evenings of excitement to a vacation of escapism. Like its Mediterranean neighbors, Croatia is a summer destination. The great news is that summer usually stretches from early March to late October. Throughout this time you can expect long warm days of sunshine and clear skies. While any of these months can be considered an ideal time to visit, there are some subtle sub seasons. March and April are the quietest, notably because the islands haven't fully shaken off their winter temperatures. On the mainland, destinations begin to wallow beneath the sun and while it's not all-day sunbathing climate, the complete lack of crowds makes this a great time to visit. May and June are indelibly pleasant, the temperature warm enough for sunbathing yet cool enough for all-day sightseeing. The temperature and tourism industry peak in July and August, coinciding with the European vacation season. As the daytime mercury reaches into the 90's, a vibrant social scene extends well past dusk on the cafe terraces. From September onwards, fall colors leave further enchantment in Croatia national parks and forests. This is another relatively quiet time to explore. Winter can be surprisingly cold and snow often falls on the highlands, providing a peculiar backdrop to the photos. Despite the temperature and shorter days, visiting the historic towns and cities remains eminently enjoyable. While you'll miss out on the beaches and sailing, a glimpse of Croatia can be easily combined with Italy or historic Central Europe during these months. Croatia's boutique accommodation is one of its highlights. While major international brands are found in the cities, much of the country is dominated by guesthouses and historic hotels determined to be unique. Baroque, Renaissance, Gothic, Venetian; there's usually a blend of old-world elegance with touches of modern Orient-Travel, the accommodation completing the immersion into iconic style and architecture. Croatia's tourism industry remains firmly in the developing stage, meaning it's far less about large resorts and far more about personal touch and intimacy. That doesn't mean any reduction in quality. Since its days as a coastal escape for the top Roman hierarchy, the country has always catered to elite visitors. Location adds to the charm. Each historic town makes for delightful daytime discovery, yet these destinations are most hypnotic when the sun sets and barbecue smells float through alleyways illuminated by lanterns. Most historic hotels have prime locations inside the walled towns, enveloping you in the rhythm of yesteryear. Many of these old towns are completely pedestrianized, helping to ensure a peaceful night's sleep when you're in the heart of everything. Along the coast, a myriad of small destinations compete for a traveler's attention. As such, sea views and a prime beach location are the norm. With so many islands and beaches, you can always expect a soft salt-aired breeze coming onto your private balcony. Medical facilities and hospitals are excellent in the cities. In rural areas the quality isn't quite as high, although it's rare you'll be more than a couple of hours from a city. When requiring medical assistance, communication can sometimes pose a challenge as English isn't always spoken. It may be advisable to take a guide or local to assist with translation. Hotels and tour companies will be happy to arrange this. It's very rare that visitors to Croatia encounter any safety problems. The country doesn't suffer the niggling petty crime problems that can be found in some major European cities. Crime levels are very low, particular against tourists. Croatian history is dominated by takeover and occupation. They've been part of many empires, most notably four centuries of rule from Venice. As recently as the 1990's there was a deadly war as the country finally achieved its independence, this time from Serbia and what was previously Yugoslavia. The country's rapid recent development is one that has taken many international observers by surprise, but not the Croatians. They've always been a resource-rich nation. It's only over the last 20 years they've been able to keep the rewards of their harvest. The modern result is a fiercely proud nation eager to assert their identity and culture. The core of this culture is a social one, manifested on town square cafes and terraces that roll with enthusiastic chatter. Take time to say hello and the conversation invariably continues for hours. Sharing a raki or a coffee confirms a new friendship. A relaxed Mediterranean atmosphere pervades throughout the country, one that's slower than Western Europe, yet professional enough to ensure the cappuccino arrives within a couple of minutes. Nothing is rushed here and so it shouldn't be; Croatia isn't a destination for charging around and checking off sights, it's a place for slowing the rhythm. While the percentage of English speakers is rapidly increasing, most of the population will only speak a few rudimentary words. The older population learnt Russian and/or Serbian as a second language, thanks to the country's Yugoslavian history and ties with the Soviet Union. Younger people are more likely to be versed in English as the upcoming generations lean towards the West. High-end tourist establishments understand the importance of English speaking staff and guides, so there should be no communication problems while in the hotel or on a tour. However, local restaurants and cafes sometimes provide humorous moments when you order with enthusiastic yet limited English speaking staff. Croatia uses a Latin writing system so it's easy to make an attempt at reading out what's on the menu. However, it's a Slavic language with little linguistic ties to the other languages of Southern Europe.